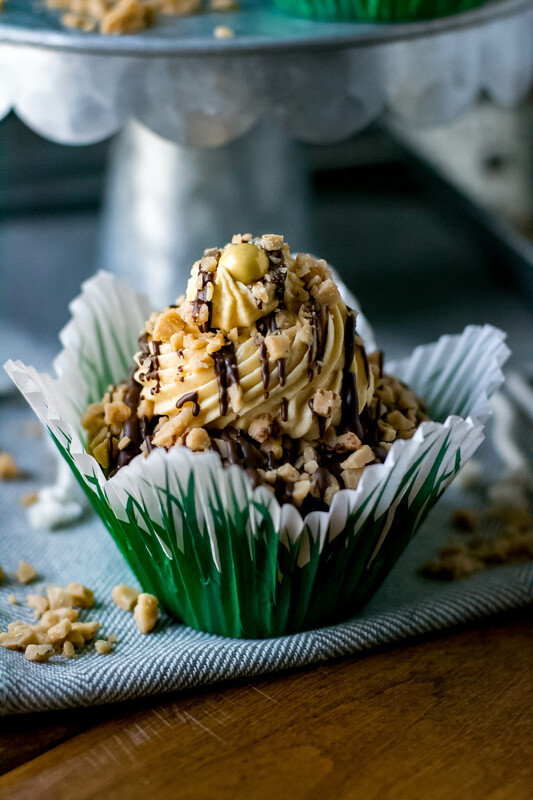 Toffee Crunch Caramel Chocolate Cupcakes - What the Forks for Dinner? Birthday celebrations are always special, but a Golden Birthday needs something extra special. 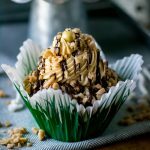 Toffee Crunch Caramel Chocolate Cupcakes were the perfect birthday celebration dessert for my nephew Brad’s Golden Birthday. Hard to believe he is 23 already……damn I’m old. We planned a surprise get together with a group of Brad’s friends….thank you Quincy and gang for keeping the secret. A local restaurant was our secret location. Brad thought it was just a family thing, his Dad and girlfriend, and Tim and I. Brad was surprised and slightly relieved to have a his group of friends join in! My mission was to make a cake for the Golden Birthday. After a big meal most folks are not really interested in cake per se, so I decided to make cupcakes. They can be easily taken home to enjoy later. Knowing that my nephew likes chocolate cake….chocolate cupcakes…of course! Using a bit of brewed coffee and intensifying it with a bit of instant coffee brings out the chocolate flavor in the cupcakes. I played off a recipe I found from Bakers Royale. The recipe caught my eye since the frosting had a golden hue and it was for a Golden Birthday. Since I am the original fake n’ bake girl the recipe was a little more than I wanted to tackle. So, I gave it my best fake n’ bake revamp! The chocolate dip was basically a gauche which I changed up to melting wafers. Not only were the wafers super easy to melt, the topping turn to a candy like top. 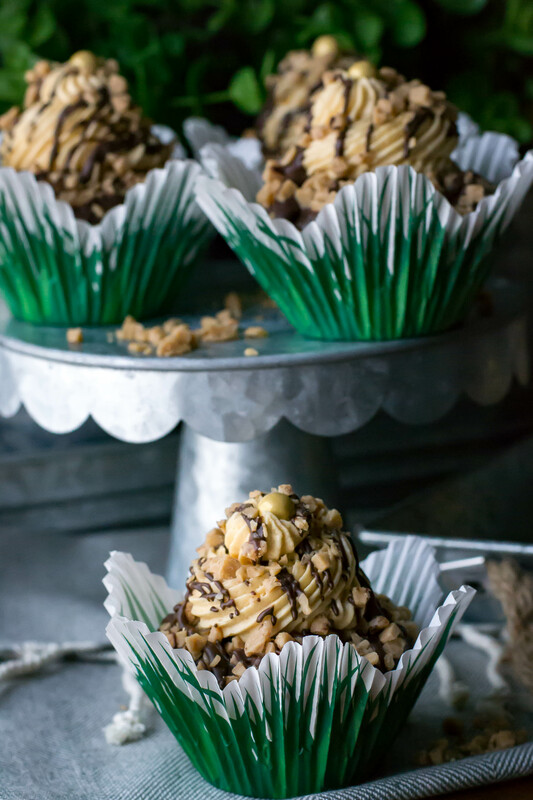 Adding the toffee bits….double crunch! For the frosting the directions were pretty intense, and it was an egg based frosting….which requires you to not scramble the eggs….pass. Cooked frostings are out of my wheel house. Instead I made a caramel buttercream, using cream cheese and Dulche de leche. I bought the canned kind. It gave the frosting a hint of caramel without over whelming it. Since this was a Golden Birthday I found golden numbers , stars ,and really neat cupcake holders … all went with the theme. Click on any of the links they are all from Amazon. As I said earlier in the post, most folks after a meal don’t really want dessert…..wrong!! A group of 23ish young men will and did wolf them down. 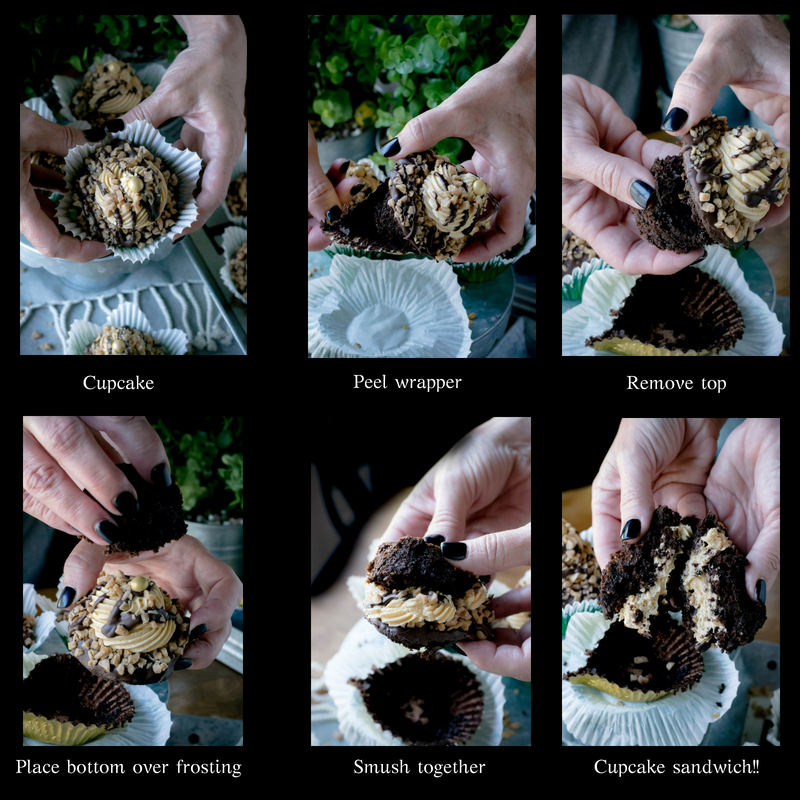 I did get a lesson in eating a cupcake…….apparently I have been doing it wrong all these years. According to Brads friend Quaide you need to take the top off the cupcake, flip the top so the frosting is in the middle….a cupcake sandwich…..who knew? Fabulous idea….thanks Quaide!!! I demonstrated in the picture below. The party was a success including the Toffee Crunch Caramel Chocolate Cupcakes! Happy Golden Birthday Brad!!!! In a large bowl, combine and sift together flour, cocoa powder, sugar, baking powder baking soda and salt. Add in butter, eggs, and vanilla and beat for one minute. Scrape down the sides of the bowl. Add instant coffee to 1/2 cup hot coffee, stir to dissolve. Add the coffee mixture and beat until batter is smooth, about 20-30 seconds. Divide batter evenly among the lined cups. Bake 18-22 minutes until a toothpick inserted comes out clean. Place cupcake pan on a rack to cool completely. Frost the cupcakes as directed below. Cupcakes can be store and serve at room temperature. Melt the chocolate wafers in a microwave proof bowl according to the package directions. Allow to cool slightly before dipping the cupcakes. In a large bowl cream butter, cream cheese, dulce de leche, and vanilla with a hand mixer or stand mixer until light and fluffy. Add powdered sugar and mix on low until incorporated. Increase mixer speed to medium high and continue to beat until smooth and creamy. Set up a dipping station for the chocolate (I left the chocolate in the bowl I melted it in) and toffee bits (I used a paper plate). Have a cookie sheet ready to place dipped cupcakes on. 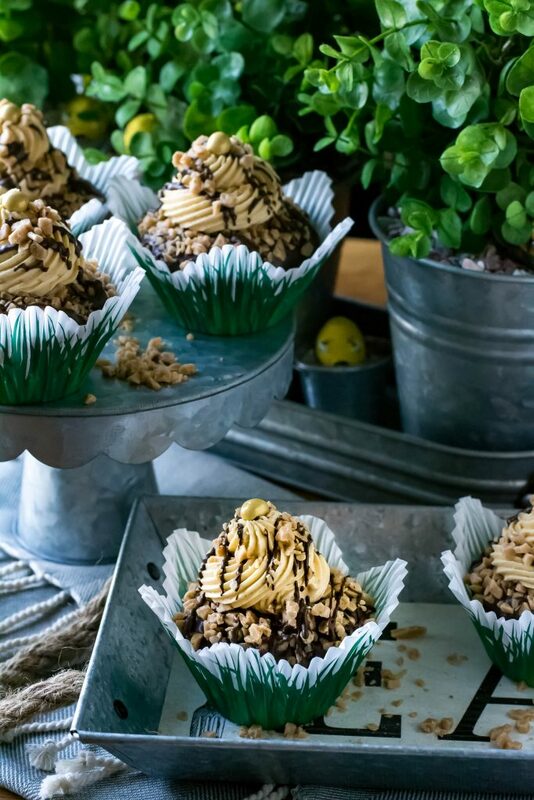 Dip each cooled cupcake into the melted chocolate and allow any excess to drip off over the chocolate bowl. 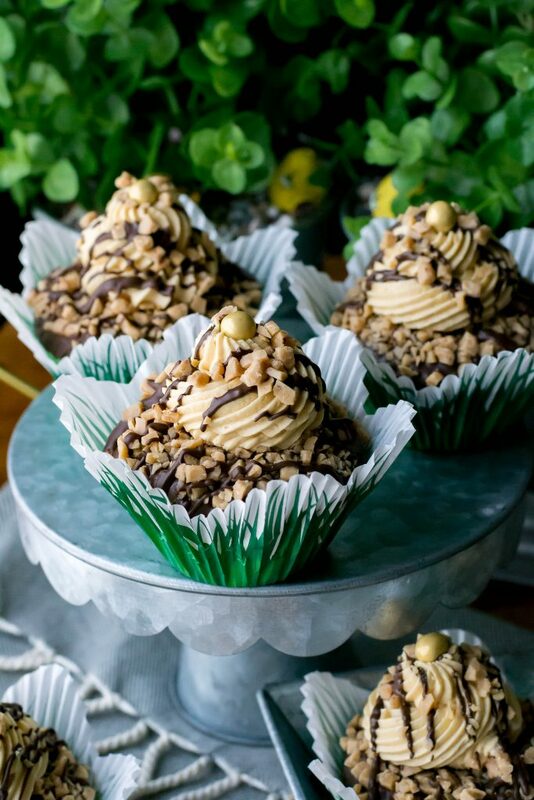 Dip each chocolate covered cupcake into the toffee bits. Place dipped, toffee coated cupcakes on the cookie sheet to set up. Place caramel frosting in a piping bag fitted with the tip of your choice. I used a large star tip. Making sure the chocolate is set ( I placed mine in the frig for a few minutes) pipe a large swirl on top of each cup cake. Drizzle with left over chocolate and extra toffee bits if desired. The gold balls on my cupcakes is a SweetWorks Sixlets Celebration 1.75oz Shim Gold that I purchased at Wal Mart. Oh boy I must try these. Yours just looked to pretty to eat. I’m sure I won’t have that problem.